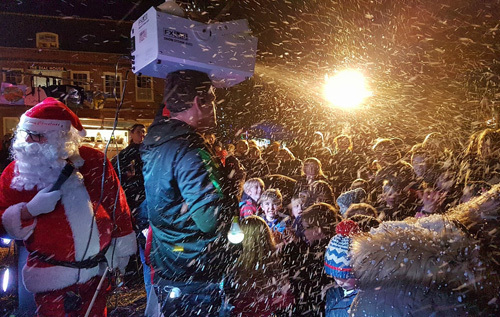 Reepham’s Christmas event, the Festival of Light, took place on 8 December and once again proved to be popular with residents and visitors alike. 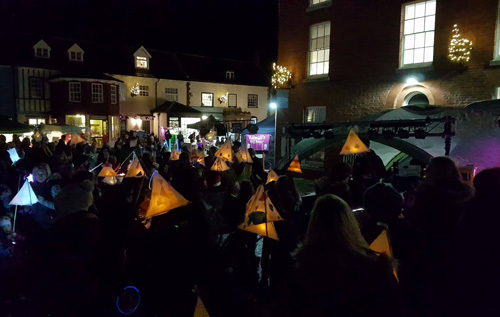 The evening started with a magical children’s lantern parade from the church to the Market Place, with many children carrying lanterns that had been made at workshops at the Primary School run by Broadland District Council. Santa arrived soon afterwards, appearing at a window in the Bircham Centre, then joining the children for fun and games in the entertainment area before moving off to his grotto to hand out gifts. Entertainer Graham Andrew provided fun and games for the children – and snow! Other entertainment on the night included the Iceni Choir and musicians from Reepham High School, who delighted the crowds with Christmas carols; the Parallel Dance Studios also gave a display. There were more than 40 stalls in the Market Place offering a wide range of seasonal goods and visitors particularly enjoyed the variety of hot food on offer. Many of the shops opened their doors to display their wares. Brenda Gostling, chairman of the Festival of Light team, expressed the team’s gratitude for all the support they had received. “This wonderful event wouldn’t have happened without the enthusiasm and help of all the stallholders and participating individuals and organisations – there are too many to list individually, but our thanks go to everyone who played a part in making the night such a success,” she said. A date has already been set for the 2017 Festival of Light: Thursday 7 December. Preparations will start in the summer.